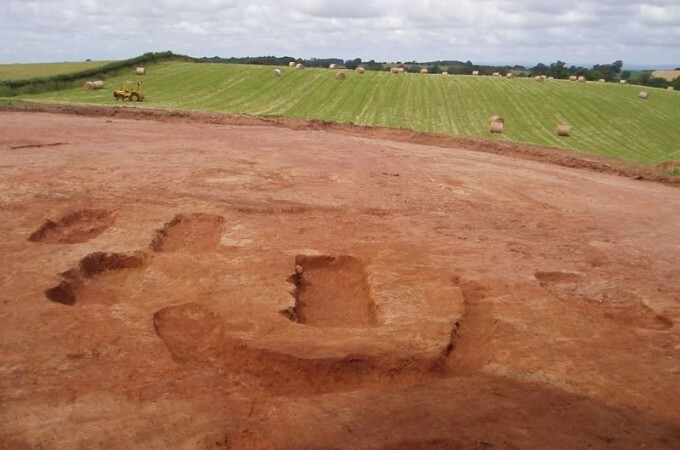 A number of exceptionally rare Viking burials, probably dating from the early 10th century, have recently been discovered on farmland at Cumwhitton, Cumbria. 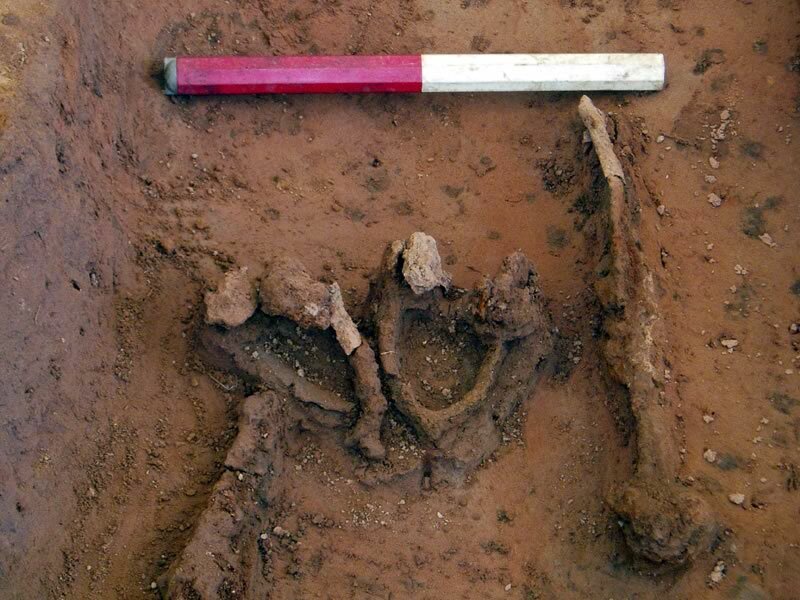 Excavations carried out by Oxford Archaeology North found six richly furnished graves, containing swords, spears, jewellery and the remains of spurs and a possible horse harness. Other than a small fragment of skull no human bone had survived in the acid soil conditions, but the objects found in the graves suggest that four men and two women had been buried here. To date, all the Viking burials that have been identified in the North West are high status individuals who probably represent the first generation of settlers who died as pagans but whose heirs rapidly converted to Christianity. The fact that the Cumwhitton burials were all aligned roughly east/west could be indicative of individuals with leanings towards Christianity who were buried in a richly-furnished pagan-style, perhaps as an example of ‘cultural conservatism’ designed to establish the presence in the landscape of recently established Norse-dominated territories. This discovery is of immense significance for our understanding of the early medieval period in the North West. It has been noted that ‘extraordinarily few’ Viking graves have been discovered in Western Europe, despite the extensive period of Norse influence, and certainly only very limited numbers of apparently Viking Age burials have been found in the North West, the majority in Cumbria. Without exception, these have been recorded in an antiquarian context, no new sites having been recorded for more than an hundred years. In all, only 12 possible or certain Viking Age burials have been identified in Cumbria and Lancashire and the majority of the recorded burials were found as single graves, some apparently in purpose-built mounds, or re-using prehistoric monuments. 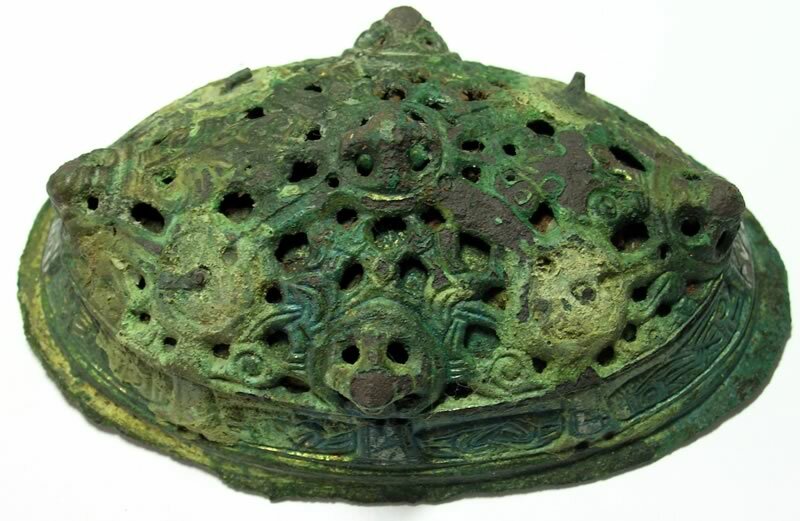 In March 2004, Peter Adams of the Kendal Metal Detecting Club found two Viking domed oval brooches in the plough soil on farmland to the rear of Cumwhitton, Cumbria . Cumwhitton lies to the south-east of Carlisle, situated within the broad valley of the River Eden. The evaluation took place between 19th and 23rd April 2004, comprising excavation of a 4m x 4m area in the vicinity of the find spots, confirming the existence of a poorly preserved body (as is commonly found in the acid soils of the North West) within a clearly defined east/west orientated grave cut that had been damaged by ploughing c 200mm deep. What appears to be the remains of a box with metal fittings and containing a series of objects was located at the foot of the burial. The occupant of the grave was thought to be female, as oval brooches are always associated with high status female burials. The finds were block lifted by Jenny Jones, the English Heritage conservator for the region, to be examined at a later date under laboratory conditions. Peter Adams joined excavators from Oxford Archaeology North on site for the duration of the evaluation, conducting regular metal detecting scans of the evaluation trench and surrounding area. During the course of this, he located a concentration of several nails, a fragment of a key dating to the early medieval period , two more fragments of what appear to be an earlier style of oval brooch(es), and a sword (probably of 10th century date), all in distinct locations less than 10m from the original find spots. After a site meeting, a project design for further work was submitted to and accepted by English Heritage. The further work comprised topographic survey and systematic metal detecting of the immediate context of the findspot area, together with an open area excavation (30m x 30m), centred on the evaluation trench. Geophysical survey (magnetometry) was also used to provide information about the wider local context of the site. From the outset the project was envisaged as a partnership between OA North, English Heritage, the Portable Antiquities Scheme, Cumbria County Council Archaeology Service, the landowners, and Peter Adams, the original finder. The topographic survey did not identify any surviving traces of mounds or other surface indications of burial activity in the area of the findspots and evaluation trench. However, the metal detecting survey identified a series of ‘hot spots’ in the north-eastern part of the main excavation area. Stripping of the area and careful hand excavation over the metallic ‘hot spots’ revealed the impact of ploughing on the below ground archaeology. Careful cleaning of the excavation area revealed five further graves, orientated roughly east/west, and an associated enigmatic curvilinear feature in a cluster to the north-east of the original grave excavated in the earlier evaluation phase of the project. Extension of the main area excavation in all directions to investigate the majority of the available ridge area did not locate any further graves. The magnetometry survey identified a series of magnetic anomalies suggestive of associated archaeological features, but on investigation they proved to be entirely natural in origin; consequently, no trace of a settlement associated with the burials was identified during the course of the project. Excavation and recording of the five new graves strongly suggested that four were richly-furnished male burials and one was a female burial, also accompanied by grave goods . All soil from the graves was carefully sieved, but unfortunately no traces of skeletal remains (or even teeth) were preserved. The range of finds was extensive; one of the male burials included inter alia a sword , an iron knife, a strike-a-light, and a collection of beads and silver rings concentrated around the neck area. The adjacent burial to the north, sk 36, contained a sword, a spearhead , a shield boss, a copper pin , and iron nail fragments. The female burial to the east, sk 27, was accompanied by inter alia a collection of beads, a jet ring, a copper alloy object and various iron objects, concentrated in the head area , together with a magnificent jet bracelet , which would have gone round the left wrist, and a copper alloy belt fitting around the waist. To the north of the female burial, a third male burial contained a sword, a spearhead, a strike-a-light, various beads and strap ends, together with a set of prick spurs and a possible horse bridle. To the north of sk 25, a fourth male burial, sk 32, contained a spearhead down by the right leg (as had been the case with the spearheads in sk 36 and sk 25) and an iron knife and copper pin in the waist/lower torso area. It is likely that the sword fragments found during the initial metal detecting of the site derive from this grave where the truncation from ploughing was greatest and the natural bedrock closest to the surface.